Help! 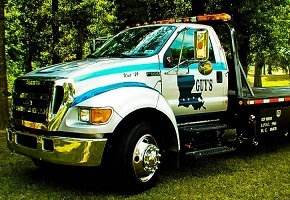 Call us for when you need an emergency tow truck in Baker LA! The last thing you need when you’re stuck on the side of the road after the work week ends is to be without a car. There are some tow truck companies that only operate when it’s convenient for them, typically during a traditional 9-5 business week. Some of them that tow your car won’t even let you pick it up until the weekend ends! 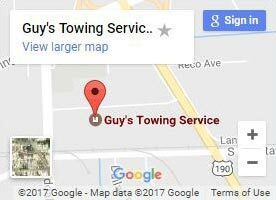 At Guy’s Towing Service, we do whatever we can to see that you get home safe. That’s why we have an emergency towing services in Baker LA available when you need it most. With 24-hour availability, call us any day of the week at any hour, and we’ll give you an honest estimate of how long it will take to get a truck out there. You aren’t really always open are you? What about holidays? Holidays are actually some of the busiest times for us! There is a strong drinking culture associated with holidays, making them riskier times to drive. And if you’ve had one too many, you might think you can make it home. Don’t take that risk! For over 30 years, we’ve offered free rides home for you and your vehicle from holiday parties. But we’re also ready to help if you have a regular breakdown on a holiday too! 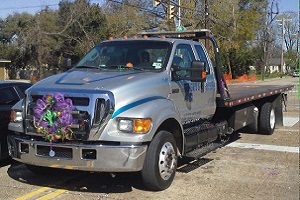 How can our 24-hour towing in Baker LA help you? It’s important that the tow truck company you choose is trustworthy and efficient. 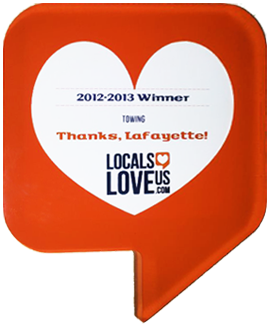 We’ve proven our dedication to Louisiana with our fast and friendly service. If you’re a visitor to the area, you might have trouble finding where you are. 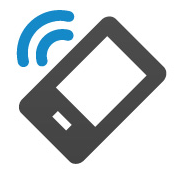 Our team can help pinpoint your location so we can get to you quickly. Don’t worry if you don’t have a place to stay in the area. We know several good hotels and will gladly drive you to one while you wait for your vehicle to get fixed. The customers know best! And with high reviews on Facebook and Google, they rave about our customer service and fair pricing! Cars, trucks, and SUVs aren’t the only things we can tow! Large residential vehicles like motorhomes and RVs aren’t a problem. Even commercial vehicles like semi trucks are no match for our powerful tow trucks. Have an industrial vehicle or broken farm equipment? Call us for help! With specialized equipment such as Landoll trailers and Peterbilt trucks, we’ll find a way to get your vehicle where it needs to be. We even do load shifts and cargo delivery if you’re hauling something that can’t wait. So give us a call or contact us at any time, and we’ll be there to answer your call! Whenever you need us, we’re ready to help! No matter where you are or what time it is, call us for 24-hour towing in Baker LA! Call us anytime, and we’ll get ready to come by to help. Do your best to explain your location and vehicle so we can send a truck. Our dispatch will give a timeframe of when you can expect us to be there.